SOS Children’s Villages became active in Georgia in the 1990s. The break-up of the former Soviet Union and the ensuing political, social and economic changes including the conflicts with Abkhazia and South Ossetia, meant that the children of Georgia were in need of urgent assistance. The work of SOS Children’s Villages has expanded to include working with young people and families in the local communities. At present there are two SOS Children's Villages in Georgia, four SOS Youth Facilities, one SOS Vocational Training Centre and four SOS Social Centres. The Republic of Georgia is located in South West Asia and borders the Black Sea in the west, Russia in the north, Azerbaijan in the south east and Armenia and Turkey in the south. Georgia also encompasses the two autonomous republics of Abkhazia and Ajaria, and the autonomous region of South Ossetia. The population of 4.3 million is ethnically mixed with Georgians accounting for 84 per cent of the population, Azeri for seven per cent, Armenians for six per cent and Russians for two per cent. About half of the population lives in urban areas with the capital city of Tbilisi being home to 1.2 million people. Georgia gained its independence from the Soviet Union in 1991. A civil war followed when the separatist regions of Abkhazia and South Ossetia demanded recognition. Dispute over these territories have continued to cause tensions with Moscow. Georgians have experienced many changes since the political events of 1991. The economy collapsed when Georgia lost its cheap source of energy from the Soviet Union and trade ties between the two countries were broken. Georgia has developed its own energy supply, namely from hydropower plants and imported gas from Azerbaijan. The country has a strategic geographical position between Europe and Asia, and it has developed its infrastructure so that it can act as a transit point for gas, oil and other goods. As the economy crumbled, the standard of living of the population fell. Unemployment increased to around 16 per cent. Although Georgia is moving towards a service-based economy, around half of the population is employed in agriculture. Grapes, citrus, fruits and hazelnuts are cultivated. The main export partners are its neighbours Turkey and Azerbaijan. The economic difficulties have also led to less investment in the health services; it remains under-funded, especially in rural areas. Infectious diseases, particularly multiple-drug-resistant tuberculosis, are significant public health problems. Children, accounting for about a quarter of the population, have a higher rate of poverty than the general population: 28 per cent of those under 18 live under the poverty line. Children in rural areas are particularly disadvantaged: they lack access to education, social assistance and health services. Georgia has a high infant and under-five mortality rate and there has been a rise in infectious and parasitic diseases. The transition to democracy has caused complex social problems which have affected children. Poverty, parental ill health, domestic violence and substance abuse have resulted in many children being taken into care in large residential care facilities. Those leaving these institutions are reported to lack the skills needed for independent living. Their unemployment rate is high at 68 per cent. Some end up living on the streets, engaged in prostitution and criminal activities. We first started working near the capital city of Tbilisi in 1996. 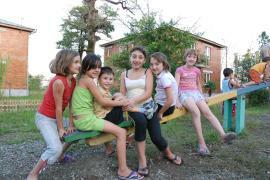 In 2002, SOS Children’s Villages arrived in a second location, Kutaisi. At present SOS Children's Village’s activities also include working with young people and providing quality day-care in kindergartens. Since 2005, the social centres have run family-strengthening programmes which work directly with families, communities, local authorities and other agencies to allow children to grow in the caring environment of their families. SOS Children's Villages ensures that the children have access to essential services such as health and education, and supports parents with finding employment and with parenting skills. 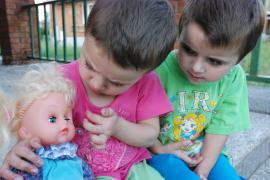 Children whose parents cannot take care of them will find a loving home in one of the SOS families.